A retelling of this magical classic story that will enchant present-day readers. The exquisite illustrations by Sarah Gibb are a delight. I consider this to be one of the best retelling of my all time favourite fairy tale. Stunningly illustrated by Sarah Gibb and enchantingly retold by Ursula Jones, it deserves a place on the bookshelf of all little princesses. Ursula Jones’s sparkling retelling of Beauty And The Beast is gloriously offset by Sarah Gibb’s bright, striking illustrations. 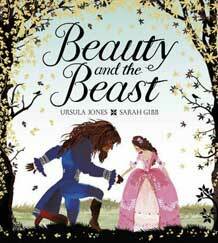 Sarah Gibb’s exquisitely detailed illustration style is perfectly matched to Ursula Jones’s elegant re-telling of Beauty And The Beast, in a longer version of the fairytale for older readers, which will grace any library shelves.